Magnus Eliasson (Sweden), Katy Buchanan (Scotland) and Steven Verbruggen (Belgium) came out the winners as almost 200 racketletes gathered in Oudenaarde, Belgium to take part in the D'Hondt Open - the fifth event on the Racketlon World Tour. It turned out to be the biggest tournament on the tour so-far and also - according to several of the top players - the best organised. Scottish racketlon star Sarah McFadyen, recent winner of the British Open, even expressed that "I don't think I've ever been involved in such a well-organised tournament, in any sport!" ...and she must have taken part in a few. Amongst other merits she is this year's winner of the Scottish indoor tennis championships. - In short, it was clear to all attendants that this was a great step forward for the game of Racketlon! Chief organiser, Jan Vercamme, did a fantastic job. 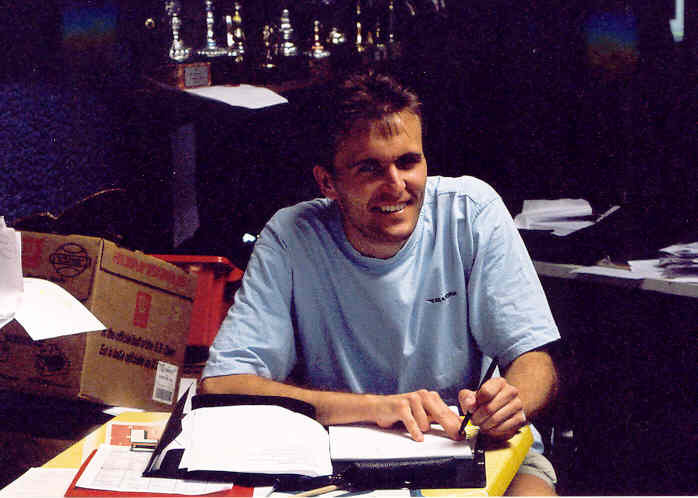 and was one of the main organisers behind the successful D'Hondt Open. Given its long tradition (under the name of "King of Rackets" it has taken place every year since 1992) there was great curiosity as to whether there would be anyone in the big Belgian community that would be able to threaten any of the established international top players. On the Men's side the answer was an emphatic and somewhat disappointing "NO!". The elite class rather turned into a national Swedish Championship. None(!) 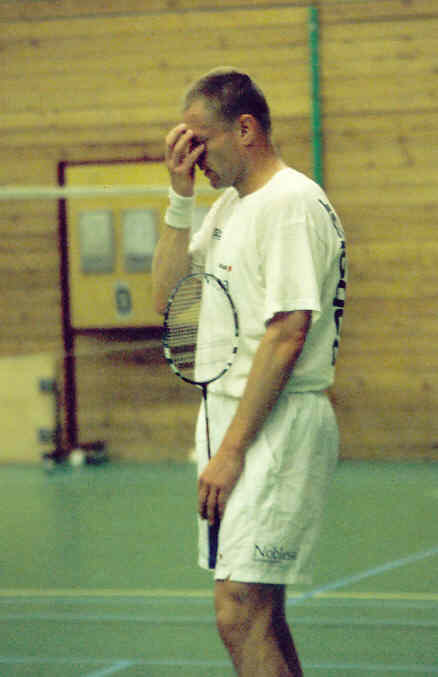 of the nine Swedish racketletes participating in the elite class lost a single match against any non-Swede. 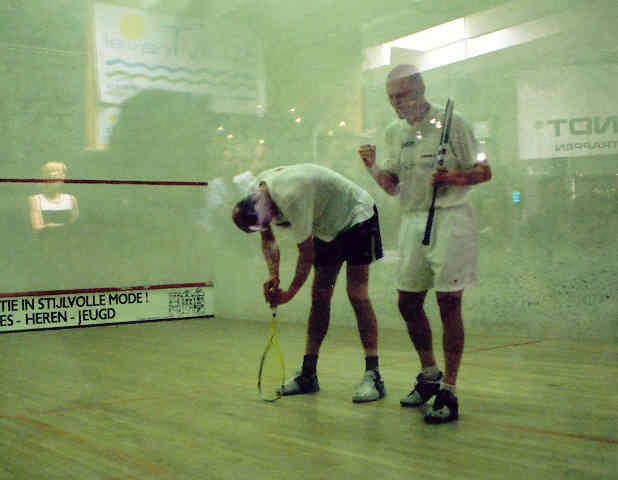 In seven out of eight groups there was a Swedish victory (the eighth group, won by England's John O'Donnell contained no Swede) resulting in 7 Swedes among the eight quarter finalists and after O'Donnell had been knocked out by Eliasson in one of them the rest was a purely Swedish affair. But a better answer is probably "No, not this time" or "No, not yet" given the enthusiasm by which the Belgians seemed to embrace the racketlon principles. "It is suddenly a real sport" one of them cheered - and hidden in that statement lies probably also the reason why there were no real Belgian challengers in spite of their decade long tradition; The earlier format employed at the King of Rackets (in which separate tournaments were played in each of the sports and the total number of ranking points collected by playing them decided the winner) was good for fun but it seems it was not quite as well suited for competition; Not a "real sport". Consequently it did not attract the attention and ambition of serious athletes aiming to excel. With racketlon Belgian multi racket sport has entered a new phase and it seems clear that the D'Hondt Open was the start of a significant Belgian presence on the Racketlon World Tour in the future. In fact, according to one reliable source "bus loads" of Belgians might be expected at the tournaments in Germany and Austria later this year. Munro played his first racketlon tournament in Scottish Open last year and has steadily climbed up the world ranking since then (25 before this tournament). He was a Class 1 finalist in the Gothenburg World Championships in November and the D'Hondt Open was his fifth tournament on the tour. This result against Stefan Larsson establishes him as a Scottish elite player to look out for. Another British player to look out for in the future is England's Nick Macey. A first warning came in British Open in April where he came very close of knocking out established elite player Henrik Håkansson. 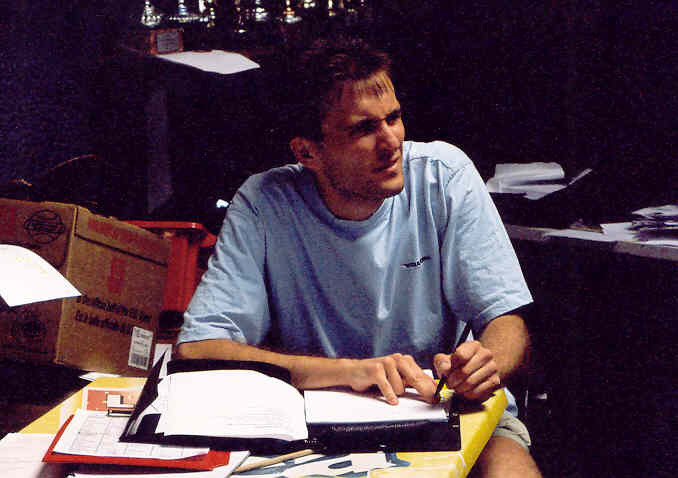 In D'Hondt Open, although troubled by a back injury, he showed his class by beating one of the best Belgian players, Luc Van Bogaert (twice - 1997 and 1999 - winner of the King of Rackets tournament) by a difference of 24 points (tt: 3-11, 3-11 sq: 11-2, 11-3 ba: 11-3, 11-0 te: 11-6, 10-11). But Macey did not have the easiest of groups and had to face Sweden's World No.4 Stefan Adamsson, an encounter that ended with a difference of 31 points (tt: 8-11, 10-11 sq: 11-8, 11-3 ba: 11-6, 11-7 te: 11-2, 11-5) giving Macey a taste of what it would take to reach the top while, at the same time, leaving Adamsson with a distinct feeling that there is yet a lot to be seen of this Englishman. A third group of interest was at an early stage termed the "Group of Death" - with special reference to the table tennis quality of its members. 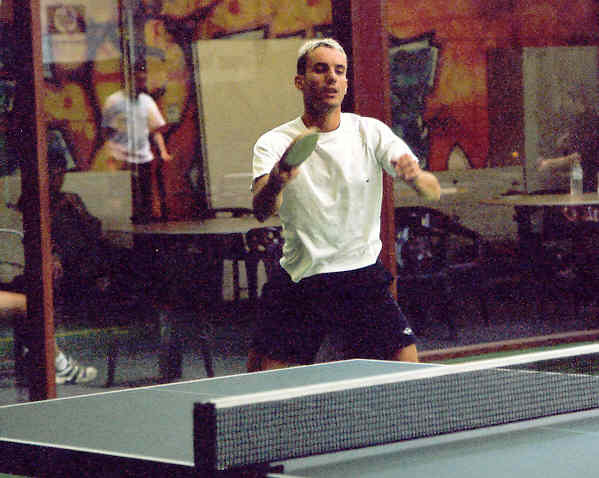 Adolphe Fernandez-Diez was formerly among the Belgian Top 20 table tennis players and his group contained Austrian table tennis expert Michael Dickert and Sweden's Rickard Persson, also a famed table tennis specialist. 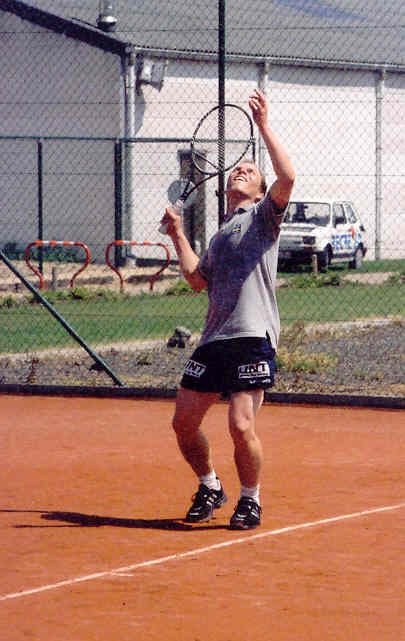 Adding to the special interest enjoyed by this group was the fact that Fernandez-Diez was a member of a multi-racket sport community of the French part of Belgium. He was, in fact, once the winner of their "King of Rackets" tournament, that took place for the last time 5 or 6 years ago. Fernandez-Diez played an even game against Dickert, which he lost by a single point (tt: 11-9, 11-5 sq: 9-11, 11-6 ba: 4-11, 3-11 te: 11-6, 9-11) but Persson showed them both quite explicitly exactly why he is world ranked No.5. Persson, who, together with Magnus Eliasson, is the only player that has taken part in all racketlon world tour events since the start in the beginning of last year, beat themm both with a margin of 26 points. As in the group play, there were few real surprises in the end game; Eliasson beat O'Donnell, Persson beat Hasmats, Adamsson beat Larsson and Källberg beat Håkansson, all according to expectations and perfectly in accordance with their respective positions on the World Ranking. In the semi-finals Eliasson faced Persson, which is normally a predictable affair, but after an impressive table tennis start (11-1, 11-1) Persson looked stronger than at any of their previous encounters. For those who saw Persson's squash against Eliasson in British Open final last April (in which he held up a perfectly even game more than half-ways into the set, that in the end slipped up to 21-13 for Eliasson when Persson's stamina ran out) it looked as if a sensation might be in the making. With the Belgian scoring system, some speculated before the squash, Persson would have a fair chance to win the first squash set and secure important points that would be lost in a straight game to 21. Not quite what Eliasson had in mind. But Persson got closer than probably ever before and the match was not decided until well into the second tennis set; Magnus Eliasson (Swe) bt Rickard Persson (Swe) +8 (tt: 1-11, 1-11 sq: 11-4, 11-6 ba: 11-6, 11-4 te: 11-7, 4-4(d)). Persson and Eliasson. Guess who is winning! Persson. Swinging in the Belgian sunshine. The other semifinal between Adamsson and Källberg was a reoccurrence of one of the semfinals of the Swedish Championships that took place only two weeks earlier and then ended with a somewhat unexpected victory for Källberg by a difference of +6 points (21-3, 7-21, 21-17, 14-16(d)). This time Adamsson lived up to his better world ranking (4 against 6 for Källberg) and got his revenge (tt: 2-11, 2-11 sq: 11-1, 11-2 ba: 9-11, 11-8 te: Not available...). Nevertheless, these recent results of Källberg emphasises a point that Källberg is also making by word of mouth; After a period of somewhat lower ambitions Källberg is now aiming higher again. 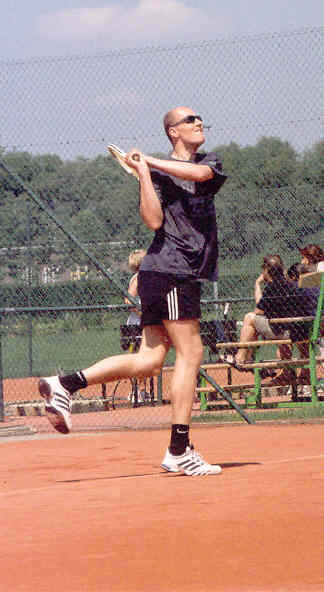 In the D'Hondt Open he finished third after having beaten Persson in the match for third prize. At the start of the final the audience saw an Eliasson that seemed to have recovered some of his table tennis form. After having been behind by 3-6 Eliasson even won the first set by 11-9 but then lost the second set 7-11. -2 before squash actually meant advantage Eliasson, who is normally aiming for "not more than minus 5 or 6 points" when playing Adamsson. Then, Adamsson got to an inspired start in squash; 6-5 at which time, Eliasson characteristically won 6 straight points, a trend that continued throughout the second set (11-6, 11-4) "I just need to play a simple game while Stefan needs to take risks in order to win points. He does not have the tools needed to kill the ball." But that ball was out!! But an Eliasson lead of +10 before badminton shrunk to +4 during the first badminton set, which contained a fair amount of drama (Eliasson tried desperately to get a lines man replaced after a close call). But after 11-6 (meaning an Eliasson lead by +9) the match was punctuated and Adamsson would not recover. Only one tennis set was needed to finish it. Magnus Eliasson (Swe) bt Stefan Adamsson (Swe) +16 (tt: 11-9, 7-11 sq: 11-6, 11-4 ba: 5-11, 11-6 te: 11-4(d)). Winner Eliasson. Back in balance.